Features zippered main compartment, exterior zippered pocket, mesh pocket and adjustable shoulder strap. Measures 15' x 9' x 10'. The Diamond Plate(TM) Motorcycle Trunk/Cooler Bag with Skull Medallion will carry your beverages to where the party and the road take you. 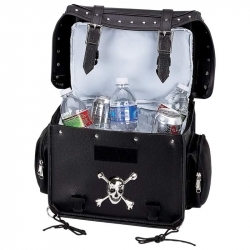 A skull and crossbones and a studded and buckle exterior will differentiate your bag from just another boring cooler. 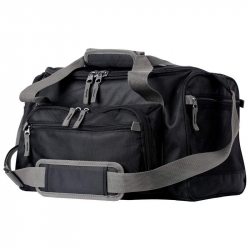 Features removable soft-sided interior zippered cooler bag within trunk bag featuring 2 end pockets, chrome studs, multiple straps for attaching to motorcycle luggage rack, carry handle, and quick-release clip closure. Measures 15' x 9' x 9-1/4'. 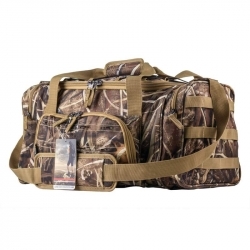 The Extreme Pak(TM) Cooler Bag w/JX Swamper Camo is your go-to cooler bag for any outdoor activity. The one piece liner has no seams, expanding cooling power and making clean-up a breeze. Rugged 600D polyester material construction in the popular JX Swamper Camp pattern. Color matching webbing and zippers, black buckles, and durable stitched zipper pull tabs. 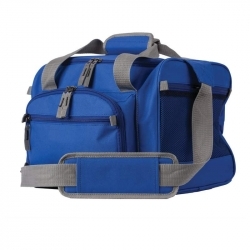 Measures 13" x 9-1/4" x 9-1/2"
The Extreme Pak(TM) Blue Cooler Bag w/Zip-Out Liner is great for a school or work lunch box, to pack water bottles and snacks when running errands, or as an all-around tote for your belongings. Sturdy polyester material construction will stand up to outdoor use. 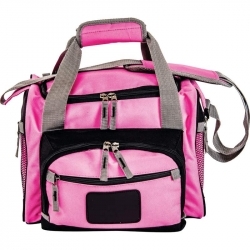 Features a padded shoulder strap, color matching webbing and zippers, and stitched zipper pull tabs. The one-piece silver zip-out liner makes clean-up a breeze. Excellent gift for the hunting enthusiast. Measures 13' X 9-1/4' X 9-1/2'. 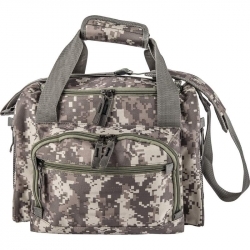 When you're ready for that Saturday golf game, park picnic, fishing trip, or hike through the woods, don't forget the ExtremePak(TM) Large digital Camo Cooler Bag w/ shoulder strap. 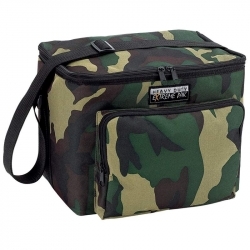 This versatile cooler bag holds everything you need for snack food and drinks on the go! The padded shoulder strap adds comfort while carrying your lunch to school, work, or extra water bottles to your gym workout. 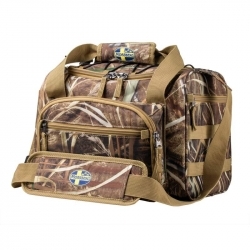 The stylish Digital Camo design features corded zipper pulls and color-matched webbing. Four large rubber feet protect the bottom of the bag, keeping it from direct contact with the ground. The one piece liner will keep your munchies cold until you're ready to snack. 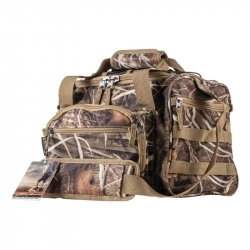 Pack the Extreme Pak JX Swamper Camo Cooler Bag w/Zip out Liner with your favorite beverage and snacks for easy carry on your next outdoor outing. Constructed of durable polyester material with matching webbing and zippers, stitched zipper pull tabs, and a padded shoulder strap. 1 piece silver zip-out liner has no seams. Measures 9" x 6-1/2" x 13-1/2". The Extreme Pak(TM) Large Black Cooler Bag w/Zip-Out Liner is great for a school or work lunch box, to pack water bottles and snacks when running errands, or as an all-around tote for your belongings. Sturdy polyester material construction will stand up to outdoor use. 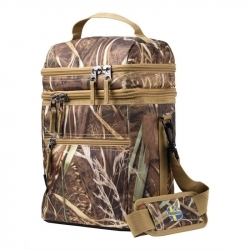 Features a padded shoulder strap, color matching webbing and zippers, and stitched zipper pull tabs. The one-piece silver zip-out liner makes clean-up a breeze. Excellent gift for the hunting enthusiast. Measures 15-3/4" x 10" x 9-1/2". 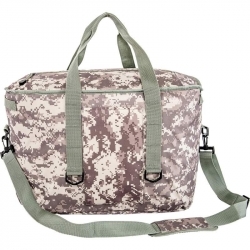 The Extreme Pak(TM) Digital Camo Cooler Bag with Zip-Out Liner is great for a school or work lunch box, to pack water bottles and snacks when running errands, or as an all-around tote for your belongings. Sturdy 600D Digital polyester material construction will stand up to outdoor use. 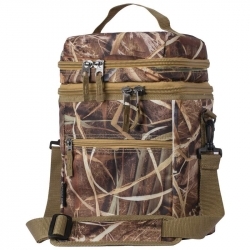 Features a padded shoulder strap, color matching webbing and zippers, and stitched zipper pull tabs. The one-piece silver zip-out liner makes clean-up a breeze. Excellent gift for the hunting enthusiast. Measures 13" x 9" x 9.5". Road and party ready, you can take your brewskis anywhere you can ride in the Diamond Plate(TM) Heavy-Duty PVC Motorcycle Cooler Bag and Backpack. Cooler bag features soft-sided, zippered cooler compartment within a trunk bag featuring 2 end pockets, chrome stud accents, and multiple straps for attaching to your motorcycle. Easily secured and portable with handle, flap with hook and loop fastener, and clip closure. Measures 15' x 9' x 9-1/4'. Spacious backpack features studded exterior pocket, zippered closure, multiple pockets for storage, and padded adjustable shoulder straps. Measures 15-1/2' x 16-3/4' x 17-1/2'. 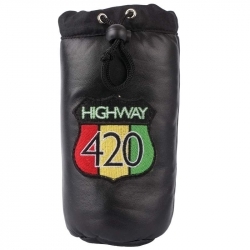 The Highway 420 Genuine Leather Pipe Storage Bag measures 7-1/2" x 3", the perfect size for carrying small essential items that normally get lost in purse or pocket! Constructed of genuine, solid leather. Black in color. All terrain. All situations. 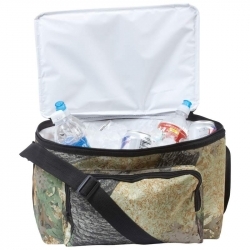 This stylish and useful Extreme Pak(TM) Camouflage Water-Resistant, Heavy-Duty Cooler Bag is ready for anything you are. Features zippered cooler compartment, front zippered pocket, rear mesh pocket, and adjustable shoulder strap. Designed to be used with refreezable ice packs (not included). Measures 11' x 9-1/4' x 8-1/2'. Be ready to hold all the things you need for a picnic, soccer game, travel, or a day trip fishing or hunting. 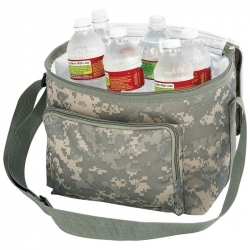 Keep your beverages and sandwiches cool and still have storage compartments for gear. Take it with you in the trunk already packed with utensils, napkins or other items and just stop for ice and drinks to complete your trip. Premium 600d resists tears, punctures and stains. Our bag is waterproof to protect its contents and just wipe clean for easy care. Bring the party where the road takes you with the Beer Bags(TM) 4pc Studded Motorcycle Saddlebag Cooler Set. The skull and crossbones emblem and the built-in bottle opener show the club you mean business. Each bag measures 14-1/2' x 13-1/2' x 8' and has a removable insulated cooler bag insert. Patent pending. 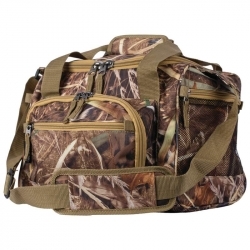 The Extreme Pak(TM) Digital Camo Heavy-Duty Cooler Bag features zippered cooler compartment, front zippered pocket, rear mesh pocket, and adjustable shoulder strap. Measures 11" x 9-1/4" x 8-1/2".